This chess games glossary + checkers is divided into 6 parts and is dedicated to avid players around the world. The first part of this glossary is the learning games section followed by chess terms and jargon in 2 parts. For those players looking beyond the basics of the game, there are 2 strategy articles to complete the chess games glossary. The Checkers page details rules, strategy and tournament tips. Chess introduction or part 1 includes history of the game, rules and play, description of chess pieces and a chessboard position graphic. Arguably, the most popular of board games, gamerisms believes that chess games should also be categorized as strategy games. Board skill games use a central tool to track a player’s status and progress. All board games maintain turn-based play in that one player’s move/strategy is followed by their opponents’ move/strategy. Players can only move at their turn. Chess is a game whose roots cover centuries of history. Chess was played in the 18th century in central Asia, and its popularity spread from east to west. Currently, chess games and tournaments are played online, on mobile phones and at live events worldwide incorporating small changes made over time to improve the game’s playability. Additionally, China and Japan have their own chess versions creating a worldwide sensation. Chess became so popular that other games took second place during the middle ages. It’s not certain if chess was invented by one or more people, but warfare was a likely reason for its development. There are many collectors and collections worldwide and some chess sets are displayed in the museums of London, Paris, Florence and various US locations. Chess sets have been created from wood, ivory, walrus, silver, gold, porcelain, bronze, and iron. The popularity of chess is definitely here to stay. To learn Chess is to respect the game, not just for its history, but also as a skill game to challenge the brain. The game of chess originated from warfare. During history, two armies that opposed each other took up their positions in nearly straight lines, separated by the battlefield. A General would outline his plans by positions and indicate the movements of soldiers. Thus, military games such as chess, were created. It’s possible that Hannibal, before the battle of Cannae, drew lines and placed stones on a board to explain his intended strategy for that battle. Chess is a game played between two opponents, represented as White and Black. Each player receives 16 men, all of the same colour. of each chess game, each player places his sixteen men on the board in a specific order. The eight pieces are the King, Queen, two Castles (or Rooks), two Bishops-depicted by a Bishops miter and two knights (Horses). The eight Pawns are representing 8 small men. King: The king moves in a chess game to any square adjoining his own, not occupied by another piece. The king is banned from moving to a square where he is exposed to capture and cannot occupy any square next to the opposing king. In moving the king to a square occupied by a hostile man, the player captures that piece. In certain cases, the king and the castle move at the same time. That move is called castling. Rook: The rook moves from its square on to any other square in the same rank provided it does not bump into any barriers according to chess game rules. Bishop: The bishop moves from his square to any other square in his diagonal provided he does not bump into any barriers according to chess game rules. Queen: The queen may make any chess game move that a rook or bishop is able to make. The pawn moves one-step forward, e xcept in its initial position, when it may move one or two steps forward. If the square in front of the pawn is taken, the Pawn is blocked, and cannot move forward at all until the barrier has been removed. The Pawn captures a hostile man placed one-step diagonally forward. This rule is modified by the capture, also known as en-passant or in passing. If when a Pawn is moving two steps from its initial position, passes an enemy Pawn standing on its own fifth rank, on either of the next adjoining files, the latter Pawn, if desired, has the right to capture the hostile Pawn en-passant. That capture or en-passant is done in the same way as if the hostile Pawn had moved only one-step. Additionally, when a Pawn by any route has reached the eighth rank of the board, this chess game piece ceases to be a Pawn. At that time, it has to be changed into any piece of its own colour, except the King. This chess game rule holds true even when a piece should have to be supplied from another box. The Knight moves on to any square not occupied by a man of its color that it can reach by proceeding in any direction two squares on its rank or file and one square at right angles thereto. If a square within reach, according to games rules, is occupied by a hostile man, the Knight may capture that man by placing itself on that square. Therefore, the Knight always moves to a square of the other colour. 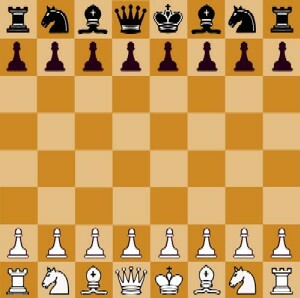 In the initial chess position, the Rook in White’s left hand corner is called Queens Rook=QR. The one in Whites right hand corner, Kings Rook=KR. Additionally, Queens Knight=QKt, Kings Knight=KKt. Queens Bishop=QB, Kings Bishop=KB, Queen=Q and King=K. 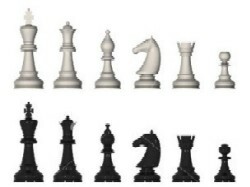 The pawns are named after the pieces behind them. The Kings Pawn KP, is the one in front of the K, etc. The White army is classified into the Queens side or the left wing, and the Kings side or the right wing. The Black army is classified in the same way; the Black Q is placed opposite the White Q, the Black K opposite the White K.
The Black QR opposite the White QR, etc. But Blacks left wing is opposite Whites right wing. Therefore, Blacks left wing is his Kings side. The square in the bottom right hand corner of the chessboard is always a white one. The Q stands on a square of her own colour, the White Q on a white square, the Black Q on a black one, when the pieces are placed on the board for game play. 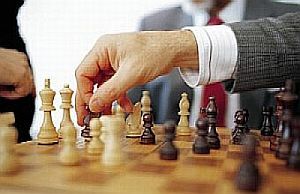 During the course of the chess game, the players change the position of their pieces according to established rules. Chess players move a man from its square to another square. No two men are ever allowed to stand on the same square. Whenever a man is moved to a square occupied by a hostile man the hostile piece is captured and removed from the board. The players move alternately and White makes the first move. As discussed, each army consists of sixteen different men; King, Queen, Castle or Rook (2 pieces), Bishop (2 pieces), Knight (2 pieces), Pawn (8 pieces).